The rearview mirror mounts that glues to windshield for mounting mirror to. 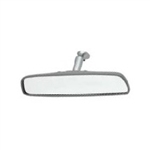 Reproduction of the stainless rear view mirror. Includes glass mount and glue. Reproduction of the black rear view mirror. Includes glass mount and glue.